It’s time for another Hungry Jpeg Giveaway!! So excited to see who the winners are this month!! 5 of you will win any current June bundle your little heart desires!! I know the winners will have a heard time picking their favorites! It’s super easy to enter as always!! 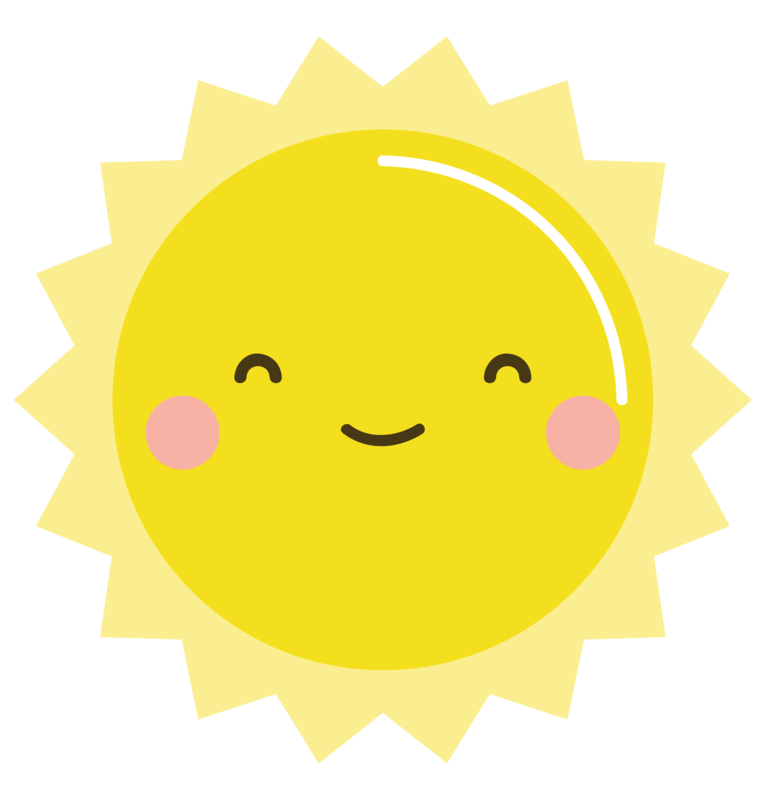 And now for your adorable Free Kawaii Sun Clipart! Welcome! So lovely to have you! Grab yourself a cup of something yummy, sit back and have a look around. There are tons of vintage graphics, artwork, papers, tags, art, school printables, holiday graphics and party collections. We even have Etsy Collections and much much more! There are so many things that you can create with our vintage palette of graphics. I love to pick out a favorite image and transfer it to a pillow or a tote bag for the market or to carry the kids library books in. My go to gift is designing a cool new t-shirt; who doesn't love a personalized custom t-shirt?! If your answer is yes, you are going to love our digital scrapbooking elements, digital scrapbooking paper and I am sure you will adore the Project Life Collection along with the extensive collection of clip art. FPTFY is full of fun and fanciful graphics that put the P in Pretty, the C in Cute and the F in FUN! So, if you are looking for a special piece of clip art, a stationery set, encouraging quotes or just a pretty image to create a handmade card you are in the right place. Don't forget that new creations are being added on a regular basis here, so check back often! Thanks for dropping by and hope to see you again…always overjoyed to see you. Have more questions? Visit my F.A.Q Page.. Can't find a specific image or project? To make things a breeze, I have carefully categorized all DIYs and images into thumbnail galleries for you to find everything at a glance. « How to: Draw a Cute Bear by Lisa Glanz + Freebies! I would choose the graphics bundle, love the flowers. What a tough choice – I hope to have a chance to make it! I think I would have to go with Wanderlust. I love both the graphics and fonts. Thank you for the wonderful opportunity to win. I love the Hungry Jpeg! If I won, I think I’d have to choose the “Worn Out Media” bundle. The fonts are so beautiful, such a treat for a typography lover like me! I love the absolutely massive craft bundle! They all look awesome!!! I think I would have to go for the beautiful Ultimate DIY Graphic bundle. What a great giveaway! I think Absolutely Massive looks good, but so does Wanderlust! Tough decision! I’m excited about winning! Id choose the July Bundle, loving the tropical theme stuff! I would LOVE the The Ultimate DIY Graphics Collection. I love the july Jumbo bundle – but all of them look great! I think I’d pick the funtastic bundle. So much cute, I love it! Why not? I love some of the Hungry Jpeg’s goodies! I would love to have the Absolutely Massive Craft Bundle. Thanks for the chance! I NEEED the DYI Graphics bundle. Love it so much! I would choose The Funtastic June Bundle if I won! Thanks for this giveaway! I’d love the craft bundle :) It’s fun to think of all the things I could make. Wanderlust ! Thanks for the chance. Wanderlust! no question about it! I would choose the ultimate graphics collection – however, all of them look amazing! I’ll choose either the the worn out media bundle or the absolutely massive craft bundle if I win! thanks for the giveaway! The Ultimate DIY bundle. They are all so beautiful! I would pick the ultimate DIY graphics collection! I love them all but I would choose the Wanderlust Travel Bundle. I would definitely choose the Ultimate DIY Graphics collection. That one has the most of what I am looking for right now. Thanks for having this giveaway! I would love the bundle my fingers are crossed I am one of the winners. I love The Worn Out Media Bundle! I’d choose the ABSOLUTELY MASSIVE CRAFT BUNDLE! Love the Absolutely Massive Craft Bundle too. Thanks for the chance to win it. Looking forward to the Jumbo July Bundle! Thanks for the opportunity to win! I love the July Jumbo Bundle ~ the fonts and graphics are TO DIE FOR! I would love to receive the ‘Ultimate DIY Graphics Collection’. I’m hoping to open a printables store, and this will definitely help me a lot. Thank you for your incredible blog!! They are all great, but I think I would go with the Funtastic bundle. I would choose The Ultimate DIY Graphics Collection Bundle. I would love any one of them, they are so cute! I think the Worn Out Media bundle is the best though! I love everything your site has to offer and all your individual bundles are the cutest! Would love to win! If I won, I would absolutely LOVE to have The Worn Out Media Bundle! It’s so gorgeous! Hard to choose but maybe either the Wanderlust Travel Bundle or Ultimate DIY Graphics. Love the Wanderlust theme. Beautiful. Thank you! I would choose the worn out media bundle! How do you pick just one?! I love the July Jumbo Bundle! I already bought the funtastic bundle, so I would go with the DIY graphics bundle next! Tough choice! Probably the July Jumbo Bundle! I’d pick the July bundle, because my birthday is in July and there’s a birthday pack! AND CATS!!!!!!! I NEED ALL THE CATS!!!! I would have a hard time choosing as I love so many of them. I´ve discovered your web a few days ago, and I wanted to apply for the contest. I´m from Argentina, and here we don´t have this quality and variety of designs. I´m impressed! If I won.. I would choose de FUNTASTIC bundle as a prize, it´s awesome! Wish me luck!!! Thanks for this opportunity. Lots of Kisses from here! All these bundles are so cute and amazing… I have just begun to learn Digital Scrapbooking, and I realize all of these would be great to have as a vital part of my small but growing collection of digital graphics… But since I have to choose one, I guess it would be… The Ultimate DIY Graphics Collection – Wow! Such beautiful illustrations and all too elegant graphics elements in one great must-have bundle! If I can win this one, it would surely be a perfect start for using in my Digital Scrapbooking and many more such creative projects, for my Learner’s Portfolio! Thank you for organizing this giveaway in my birthday week! I have just recently discovered your website and all of your beautiful creations. I used some absolutelynbeautiful paper to make an engagement card for my daughter and her fiancé and I can hardly wait to use more! I would love to win the graphi. I sleep as I could use it for so many of my crafting adventures! Thank you for all of your products. Inspiration ans the chance to win a bundle! !